If there's one dependable crop we get year after year, it's raspberries. 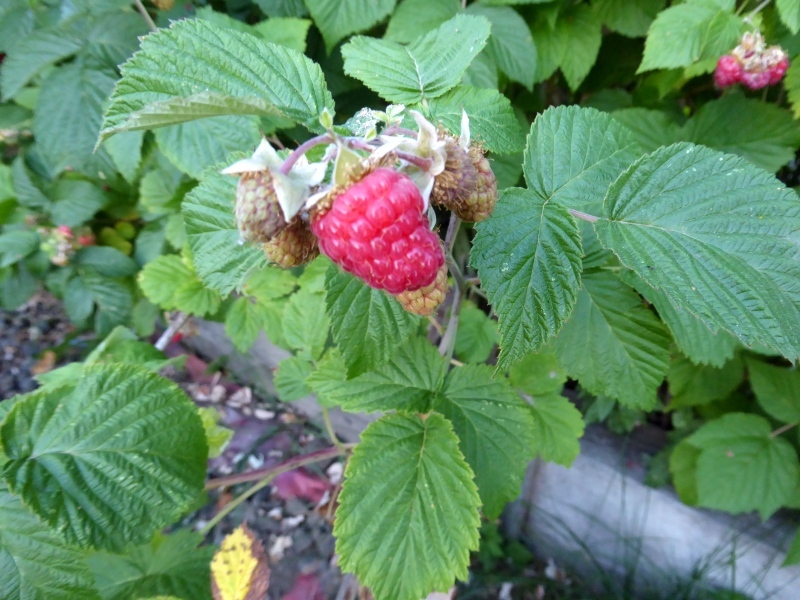 Raspberries are Younger Daughter's favorite fruit, and in years past picking them was more or less her province. In her absence this summer, the task has fallen to Don and me. 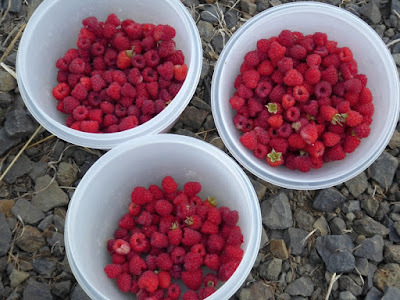 And since it's been blazing hot in the daytime and there are too many mosquitoes in the late evening when it's cooler, I've been going out around 5:30 a.m. to pick berries. 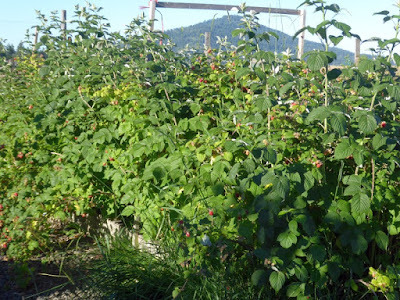 This early in the morning the raspberry bed is still in the shade, and the chore is pleasant rather than something to dread. I pick every other day and usually get about three half-bowls of fruit (I don't like to pile the berries too deep lest they get crushed under their own weight). I decided not to make jam (we're not big jam eaters) or freeze them this year. Instead, I'm dehydrating them. I pick through the fruit and lay them on the mesh screens over each tray. The berries shouldn't touch. 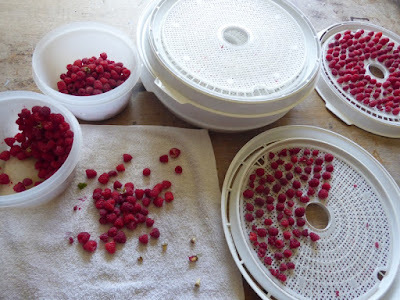 Online sources for dehydrating raspberries always recommend washing them and laying them hole side down to drain. However this assumes the berries are purchased and passed through numerous hands before they reached your kitchen. 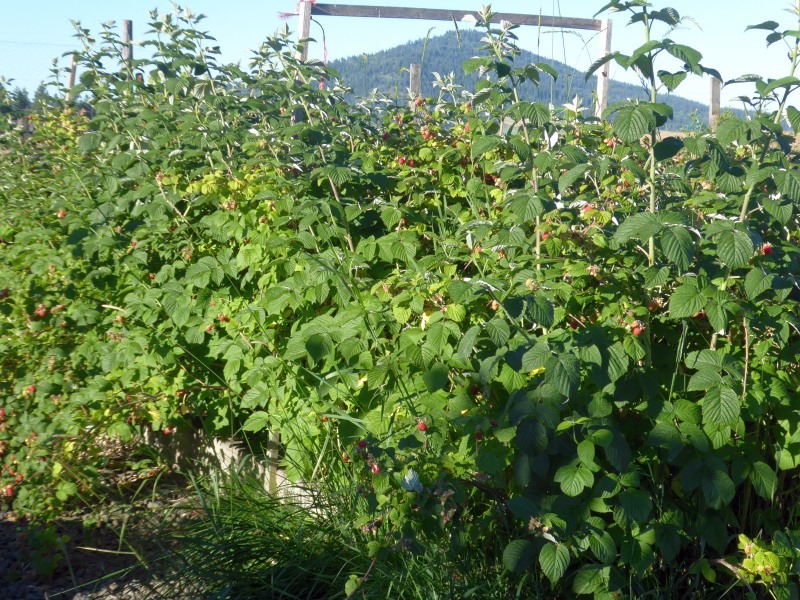 Since our berries are fresh off the bushes and since I water them every day (which washes dust off), I just pick over the berries dry and lay them hole-side-down on the trays. I set the dehydrator at 135F for 18 hours and leave it alone. When the time is done, the upper trays often have a few berries that are still a bit squishy, so I rotate the trays and put the heat on for another 4 hours. Unlike something like red bell peppers, which shrink down in the dehydrator to a remarkable degree, raspberries maintain both their size and shape once they're dried. They're brittle and bursting with concentrated flavor. Frankly they look and feel freeze-dried. Way cool. Dehydrating doesn't seem to be a popular preservation option for raspberries, which seems a shame. Besides being easy to store, dried berries are versatile. 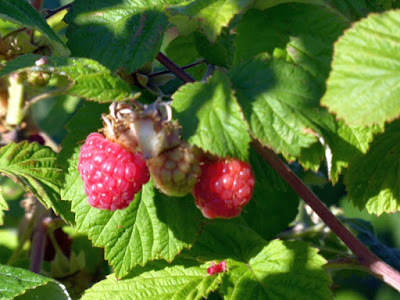 They can be used to make tea, they can be reconstituted and used to flavor yogurt, they can be reconstituted and made into fruit salads or desserts -- in short, they have many uses. If freezer space is at a premium and, like us, you're not big on jams, then dehydrating raspberries is a wonderful and easy option. What cultivar are those gorgeous berries? They don't look too terribly thorny. The ones I have are so thorny, picking is just awful. No idea, sorry. I got them from a friend. I do know they're thornless. Here is another idea for you if you like muffins, coffee cake, etc. If you use dried (or freeze dried) berries in baked goods, the area around them does not get soggy. I use dried berries in baking for this reason. Enjoy the fruits of your labor. I'm not very into sugary jams, but I do like things like raspberry-jalapeno sauce, which goes great with a chicken or turkey dinner, on a sandwich with cheese and/or meat, etc. Making less sweet, more savory things is more interesting to me. Raspberries are my favorite berry. Went to the thornless last year. Much nicer to pick. I did notice there was not a second crop later in the summer and fall. Have you seen that with yours? I understand dehydrators filling a niche for folks. We bought one and but these factors motivated us to sell it. Initial Cost: $250 was a lot of money for a nice but not-vital kitchen accessory. Electricity: 600 watts (typical) for 20-24 hours was not cheap. Heat: Most of our use occurred during warm weather when the potentially valuable heat went out open windows. Survival: In a grid-down situation the machine (and investment of $250) would be of value. Just some factors one might want to consider. I have dehydrated black berries, very delishous, and dehydrated blackberries. both are great, but attention needs to be paid to make sure they are bone dry, or you wil get the sticking like petes freeze drying experience. 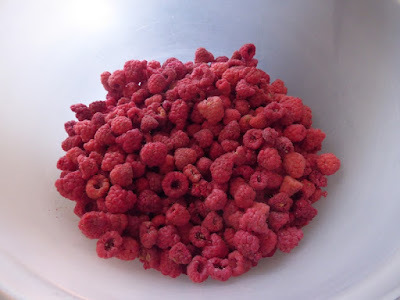 I would dehydrate raspberries if they were not so high in the store or I had my own bushes. How many bushes do you have? They sorta spread, but I think I planted about 15 or 20 starts several years ago. I pick wild ones that grow near by. I picked a pound so far and they get eaten faster then I pick. If I ever get too many I would try this. 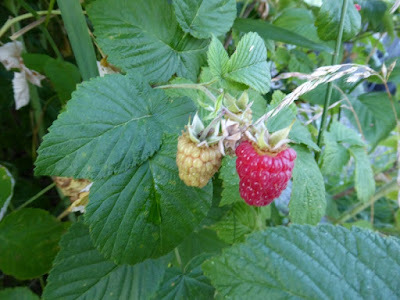 I just said today that I wanted a raspberry bush! Nothing better than fresh berries. We have 5 bushes on their 2nd year. It's like having breakfast in your yard when they're producing. I mix my raspberries with cherries to make a great pie.